If you wanted to find a woman who broke every mould, every pre-conception, every assumption when it comes to women’s tennis, you could do better than look at—or more pertinently listen to—Marion Bartoli. She has not missed a Grand Slam since 2002 yet has not reached a final since 2007—and that was here, where she lost to Venus Williams. She has not won any title since 2011, yet her 13 years on the pro tour is punctuated by peaks: finalist in Carlesbad and Paris last year, in Indian Wells and Strasbourg in 2011, in Stanford in 2008—and of the course at the All England Club in 2007. After 10 attempts and seven losses in the first two rounds, she finally made the last four at her home Slam at Roland Garros in 2011—then lost early in both subsequent years. She reached her first US Open quarters at her 11th attempt, last year and has only reached the quarters once at the Australian, as well. On court, she is pugnacious, a shorter-than-average powerhouse with venom in her eyes, and unconventional double-handed weapons on both forehand and backhand. Her ball-toss is huge, her serve a match winner or a liability. And set amid her aggressive tennis, she shadow-boxes behind the baseline, a bundle of nervous energy, a distracting and intimidating presence for whoever is down the other end. And until this year, she has steadfastly remained an outsider, choosing to forsake the French tennis establishment to plough her own furrow with her equally unconventional father. They have rowed during matches—she has even banished him from courtside—but theirs has been a long and loyal partnership. So it was remarkable—yet at the same time no surprise—that this independent and formidably bright young woman chose to drop her father as coach and come in from the cold to seek the support of France’s former Wimbledon champion, Amelie Mauresmo. Since then, Bartoli has suffered several injuries, so the wins have not flowed—until she got her feet back on Wimbledon’s grass: She has reached the final, six years after the last one, without dropping a set. And that means the British public has had a chance to see the flip-side of the woman with the most brutal training regime on the women’s tour and the most urgent and, for some, distracting mannerisms on court. 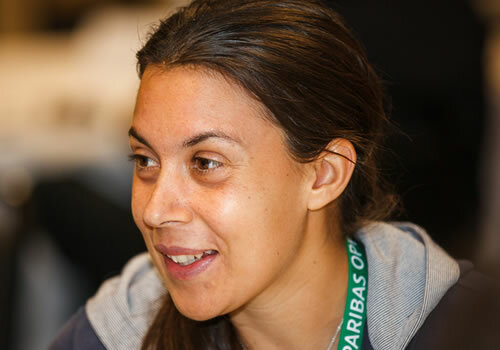 That flip-side is the lovely woman with sparkling ebony eyes, a torrent of near-black hair, and a smile to warm the most hard-nosed of journalists: the elegant and oh-so-French Bartoli, the quietly charming Bartoli, the witty and smiling Bartoli. She goes into the final against the extrovert, sunny German, Sabine Lisicki, whose smile and tennis have captured the hearts of the Wimbledon faithful like few others. But spend some time in Bartoli’s company—as her words in the obligatory pre-final press conference demonstrate—and she must surely capture those Centre Court hearts, too.